For the past several years I have worked toward writing my memoirs. I have shared many of them here. Today I would like to share another such memory. When I am done I will invite you to a much-needed conversation. I was writing of the summer in 1958. My family arrived from Baton Rouge at our annual Camp Meeting. My two brothers and me were playing in an open field across the street from all the church activities. Mom sat on a bench and read while we played. A short time had passed when we noticed a black boy and his little sister were watching. They eased a little closer. We needed a fourth player so one of us asked if he would like to play. The boy, we’ll call him Ben, hopped up off the ground and joined in. We had a great time. His sister sat by herself until Mom invited her to sit with her on the bench. A short time later we began to notice a black woman hiding and watching from between some cars. When Ben noticed her, he stopped playing and ran to her. Yes, it was his mother. He took her hand, walked her to my Mom and introduced her. The two mothers talked, while we continued to play. Ben’s mother was uncomfortable sitting on the bench with a white woman so she and Mom stood to talk. Having a lot of fun, time flew, and lunchtime arrived. My parents were forever packing a picnic lunch, usually fried chicken and pimento cheese sandwiches. Mom invited Ben’s entire family to stay and eat lunch with us. His mother was reluctant at first but, after my mom assured her we had plenty, she gave in and joined us. We enjoyed our picnic but could only wonder why Ben’s mother was was constantly looking around while we ate. She seemed nervous and to be watching for someone. After lunch, Ben and his family left and we never saw them again. We looked for them so we could play during the week, but never found them. We assumed they went home. Whenever I go to Anderson University, my alma mater, I think of this moment. I tell you this story because, at the age of eight, I believe this to be my first encounter with how different we are. I did not understand what black families went through back in the 1950’s. The racial divide kept me away from black Children. The animosity of whites towards black could even be felt at a camp meeting where our whole purpose was to worship a loving God. I am sure the family left and went home simply because of the overwhelming impression of being unwelcome. I look back at how unusual it was for this playful event to have happened in this era. How uneasy the mother of these two children must have felt. How easy it was for my Mom to invite them, because her white world was protected, is compared with the protection Ben’s mother wanted to provide, and yet gave in to an invitation. She knew it was the right thing to do as a Christian. But the responsibility of protecting herself and her children was foremost in her mind. No wonder she was looking around. Society had taught her to fear the repercussions of white people. She worried about the wrong person watching them play, talking and even eating with a white family. Worried about danger stirring among those who may have despised her simply because of who she was, who her children were. When I see this anger and frustration vented today, I remember this encounter so long ago. I see a young Ben playing with us. I see his mother watching and yet alert in protecting and still allowing things to happen between us. When I remember this occasion I am struck by what I see today. No wonder Black people are angry. No wonder there is a growing hatred. No wonder we see a cultivation of divisiveness that is nurturing our society. No wonder satan is excited. Two people with different pigmentation cannot get along because the hatred they have been taught separates them. You and I are different from the rest of the world. We have a personal relationship with Jesus Christ. We can sit and talk, and respect each other, because of the One we love and follow provides the grace for us to do so. But, we have to want to. The world around us doesn’t know Him. Their lives cannot change because there is no one who will help them recognize what is causing this hostility and see that it will destroy all of us. As believers in the One True God we cannot sit idly by and do nothing. I did not understand what black families went through in 1958. I can’t pretend that I know in 2017. I realize that most children are colorblind. But I ask you, where and when did this stop? How can we get back to being colorblind of race and live for the purpose of unity in Christ body and the sharing of His message of salvation? We look at this memoir and say, “Well, this was an encounter of children. They don’t understand.” I ask, understand what? That we can’t get along the way children seem to? You are right, children have not developed a racially charged worldview at this point and therefore are willing to play together because they have the same purpose. I wonder if our world today can heal? Are we capable, as children, of sharing the same purpose? In Christ, I believe it can happen. Like this young Black family of the 1950’s they were willing to join my family for an unforgettable day. I have often wondered if the impression left on me, after all these years, lingers with Ben, now a grown man. We both learned that we are capable of living together in unity, sharing a glorious life in Christ. As mentioned above, I want to invite you to a much-needed conversation. This conversation is not with me. No, the conversation is with God. He invites you to search your heart. Ask Him to expose any animosity you may have toward another race, known or unknown. When He reveals this to you, ask forgiveness. Don’t stop there. Renounce this sin. This means to cast it off and never pick it up again. Abandon this sin never to return to it (2 Corinthians 4:2-3; Proverbs 28:13). We are all one in Christ. Be kind to one another, tenderhearted, forgiving one another as God in Christ has forgiven you. We are a fragrance of Christ to God among those who are being saved and among those who are perishing. Are you that fragrance? We are to be as one who has been brought from death to life. We are to offer every part of ourselves to God as an instrument of His righteousness. In Jesus we find our peace; He has made us both one and has broken down in His flesh the dividing wall of hostility. So love others, regardless of the color of their skin, as you love yourself (Galatians 3:28; 2 Corinthians 2:15; Romans 6:13; Ephesians 2:14; Mark 12:31). Could You Forgive a Murderer? God can set anyone free from inner pain and unforgiveness. I pulled my baking sheet out of the oven and inhaled the sweet scent of chocolate chip cookies. When I bit into a warm one, my tears came — again. These cookies were bound for the male inmates in one of our state prisons. Would one of the three men who’d killed my husband be eating them? I hoped so. But I never would have believed that thought was possible. On September 27, 2005, my twenty-year-old son, Brandon, left a message at work for me to call him. I presumed he wanted to talk about a job interview he’d had that day. My stomach lurched. I thought of calling my husband, Kim, but started shaking. What if something had happened to him? I pressed my hand over my mouth and ran to the restroom. She nodded. The room swirled, and I collapsed into her arms with a gut-wrenching scream. How could my husband be dead? I’d talked with him on the phone during lunch. Didn’t Kim say he’d left work early and was home? We’d joked and laughed. Was it a heart attack? What if the gun he’d been cleaning for the hunting season had accidentally gone off? His final words — “I love you, darling” — squeezed my heart. Just then, Brandon ran up to me. Chests heaving, we clung to each other and wept. My son told me he’d come home and found Kim, his stepdad, lying on the basement floor in a pool of blood. He’d been beaten and shot in the head. 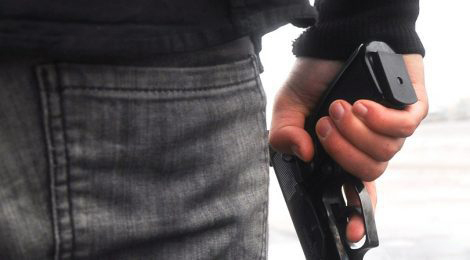 Many of our electronics and guns were gone, including the handgun used to kill my husband. My mind reeled. Who could be so cruel? Two days passed before the police allowed me to go into my home. I was numb as they escorted me through the house and questioned me. When I entered our master bedroom, I gasped. The blue-gray T-shirt Kim wore the last time I’d seen him was splayed across our bed. I grabbed the shirt — the closest thing to hugging Kim — and breathed in his clean scent. Tears flooding my eyes, I slumped like a rag doll on the bed and wept. After Kim’s funeral, I moved back into the house with Brandon. We installed a burglar alarm, but it didn’t alleviate our fears. What if the murderer was someone we knew? I kept the alarm’s panic button with me at all times. Nights were the worst. Unable to sleep, my mind searched for answers. I listened for the slightest sound, rushed to Brandon’s bedside whenever nightmares woke him up and he needed me. My only comfort was prayer and Deuteronomy 31:6: “Be strong and courageous . . . for the Lord your God goes with you; he will never leave you nor forsake you” (NIV). A year after Kim’s death, the handgun was found, leading to the arrest of three men. However, relief morphed into impatience as I waited another year and a half for the trial. During that time, Kairos Prison Ministry came to our church to organize an intensive weekend Bible study at one of our state prisons. They asked for volunteers to bake cookies for the prisoners. I crossed my arms. I hadn’t baked cookies since Kim’s death. And I wasn’t going to bake them for some criminal. My back stiffened as I leaned against the cushioned pews. Preach the gospel if you like, but I want justice. I rushed out of church and drove home. Although the men were behind bars, I double-bolted the door and threw my car keys on the granite kitchen counter. They landed with a clanking thud next to a package of store-bought cookies. Bake cookies? I breathed deep and listened to Christian praise music to calm my nerves. Lord, it’s going to take more than a batch of cookies to soften my heart. And then I had to face my enemy. For seven days in September 2008 I sat in the courtroom behind the two men who killed my husband, and stared at the back of their heads. The third man had already pled guilty and testified at the trial. As I listened to the prosecuting attorney, I learned the men had needed money, mistook our house for someone else’s, and thought the place was empty. “If only’s” replayed in my head. If only the seventeen-year-old who pulled the trigger had stayed in school that day. If only they’d entered our neighbor’s house, my husband would still be alive. If only Kim’s pistol had been in the gun safe. I’d never seen the crime scene photographs until the trial. Now, seeing the horror of Kim’s final moments crushed my heart. I wept countless tears. My anger grew. I kept waiting for the men to face me. Beg for my forgiveness. Even when I was on the witness stand and excused myself because I became sick to my stomach, their cold, dark eyes stared straight ahead as though I were invisible. The jury found the men guilty of first-degree murder, and they each received a life sentence. End of story, or so I thought. Negative thoughts consumed me. I tried to forget the past for the sake of my family and health. I even volunteered to bake cookies for Kairos Prison Ministry. As I stirred the chocolate chips into the dough, tears rolled down my cheeks. What would Kim say if he saw me baking cookies for convicted felons? I wiped my eyes and set the oven timer. Lord, make my spirit as sweet as these cookies. Use them for Your glory. As the scent of chocolate chip cookies filled the kitchen, I prayed for the men who killed my husband. I prayed for them by name. They weren’t evil men. The poor decisions they’d made in life became a domino effect that led to Kim’s death. Now they suffered the consequences. Maybe I could forgive them, but my heart needed more time than it took to bake several dozen cookies. My prayers were answered, but not in the way I expected. My son had become addicted to prescription pain pills he’d taken for a sports injury, and he wanted something stronger to purge the memory of finding his murdered stepfather on the floor. I couldn’t get there fast enough. When I saw the dark circles under his hollow eyes, my body swayed; I had to look away. A thick glass window separated us, and we used a phone to hear each other. I offered to post bail, provided he went to a Christian rehabilitation program. Brandon agreed but realized it would take about a month to get accepted. When our visitation ended, Brandon stood up to leave and looked back at me over his sunken shoulders. His pleading eyes, filled with despair, yanked my heart. I bowed my head and sobbed. I loved my son, but only the Lord could save him. He needed God’s grace — the same way I did. I thought of the other men sitting in prison. Where was their hope? Did they know about God’s grace? Visiting my son in jail roused my compassion for prisoners. In addition to baking cookies, I hosted an annual hayride and invited the community to bring toys for the Angel Tree Program. But my heart wouldn’t rest until I wrote the men who murdered my husband. I clutched the letter to my chest. How long had I waited for an apology? As if “I’m sorry” could ease the pain. All along, this man had been praying and waiting too. The young man who pulled the trigger also replied with heartfelt words that made me weep. God had been working in all our lives to heal, redeem, restore. When another organization, Forsyth Prison Ministry, asked for volunteers to participate in their services at Cherry State Prison, my hand went up. On a summer evening in 2014, I walked through the metal detector of that prison with a plate of cookies and a heart filled with praise. The next year, I shared my story. My knees wobbled like Jell-O as I stepped in front of a hundred inmates. Their eyes widened as I described Kim’s ghastly death and how that led to my son’s drug addiction. I told them I’d forgiven the men who killed my husband and continued to write them. Some inmates wiped their eyes. Others slowly shook their heads. The men gathered around me to shake my hand when I finished speaking. 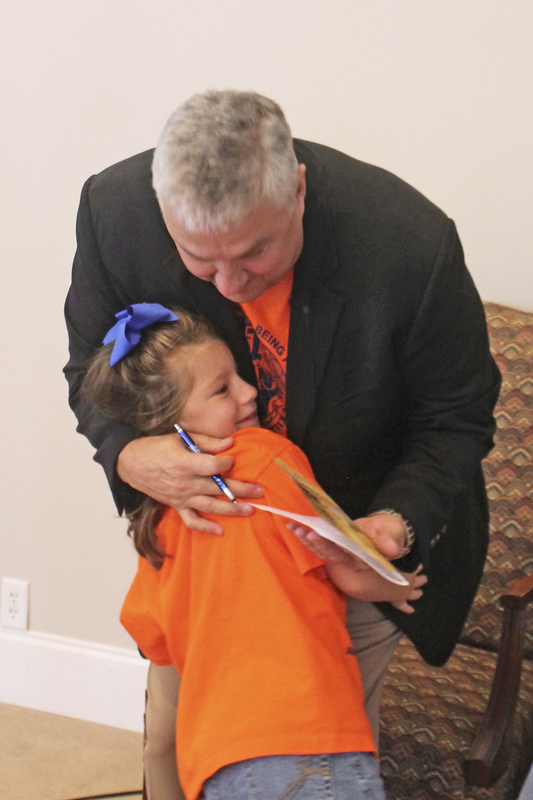 I longed to ignore the prison rules and hug them. People ask how I could forgive the men who killed my husband. Sometimes, I ask myself that question when I see Kim’s shirt tucked in my dresser drawer. Or when I bake chocolate chip cookies for prison ministry. I tell them God’s love softened my heart, one batch of cookies at a time. In Part 2 we discussed if we have a right to be afraid and should we stand against those who want to kill us. If we remember the fear David experienced while he was running for his life we understand that at times we do have fear in our lives. This is not God’s perfect will for us. His will is that we enjoy an abundant life. The way we receive this life is by living within His will. We know His will by His Word, the Bible. We also know His will by communing with him on a personal basis. Communion with Him is how we overcome Goliath when he tries to frighten us into submission. So this brings us to the last question. This is the same question David asked in Psalm 11:3, our premise for this series. While praying and searching over the last several months the Lord has placed several thoughts in my heart. I am excited! When these revelations hit me it was like a hand slap to the back of my head. These are nothing new. 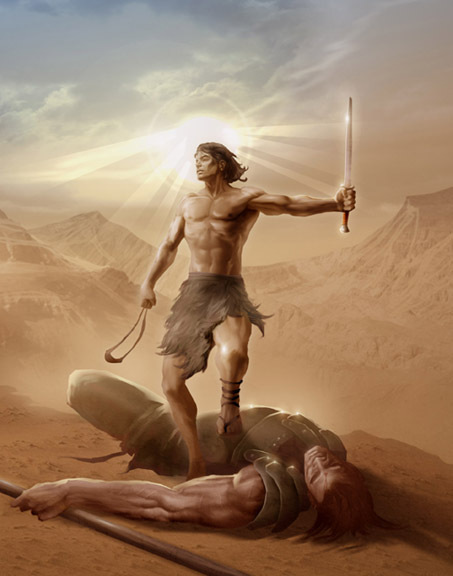 This is how every man of God in the Old and New Testaments defeated his Goliath. As Christians the following revelations are what we should be already be doing, everyday. What a wake-up call. If we are not doing these things then we are not prepared for any Goliath, let alone this one. Search your heart and see if you are doing these things. I know there must be many more to add to this list. Feel free to add anything God lays on your heart. We have been given permission, the freedom, the liberty, the ability to become, and the power to conquer. We are fellow helper’s to the truth. We are the vehicle the Lord uses to bring someone to the knowledge of salvation. We find our peace, joy, comfort, guidance and direction through Him. We are adopted children and brothers and sisters of Jesus Christ our Lord. Jesus is our wisdom and righteousness in everything we do and say. He will reward us if we diligently seek Him. We have our hope in Him. Do NOT lose heart: 2 Corinthians 4:16-18so we do not lose heart. Though our outer self is wasting away, our inner self is being renewed day by day. For this light momentary affliction is preparing for us an eternal weight of glory beyond all comparison, as we look not to the things that are seen but to the things that are unseen. For the things that are seen are transient, but the things that are unseen are eternal. Encourage one another and fellowship together. 1 Thessalonians 5:11 “Therefore encourage one another and build each other up, just as in fact you are doing.” In other words you should already be doing this and now is not the time to quit. Ephesians 5:19-21 “speaking one to another in psalms and hymns and spiritual songs, singing and making melody with your heart to the Lord; always giving thanks for all things in the name of our Lord Jesus Christ to God, even the Father; and be subject to one another in the fear of Christ.Are you living your life as the fragrance to God? Are you living your life as an example to the unbeliever? a) Love one another. John 13:34 A new commandment I give to you, that you love one another: just as I have loved you, you also are to love one another. b) Love those who hate us. Matthew 5:44 I beseech you therefore, brethren, by the mercies of God, that ye present your bodies a living sacrifice, holy, acceptable unto God, which is your reasonable service. Matthew 5:43-48 “You have heard that it was said, ‘Love your neighbor and hate your enemy’. But I tell you, love your enemies and pray for those who persecute you, that you may be children of your Father in heaven. He causes his sun to rise on the evil and the good, and sends rain on the righteous and the unrighteous. If you love those who love you, what reward will you get? Are not even the tax collectors doing that? And if you greet only your own people, what are you doing more than others? Do not even pagans do that? 48 Be perfect, therefore, as your heavenly Father is perfect. This is not something we just say, it is something we must do. If this New Goliath comes against us there will be those, both saved and unsaved, who will need our comfort. Are you living your life in a way that these will feel comfortable approaching you? If you love me, you will keep my commandments I beseech you therefore, brethren, by the mercies of God, that ye present your bodies a living sacrifice, holy, acceptable unto God, which is your reasonable service. Remember the Old and New Testament saints we mentioned in Part 2? They are examples of obedience. Hebrews 12 gives us a list of so many who provide us with an example of faith. Remember, “. . . with out faith, it is impossible to please God, for whoever would draw near to God must believe that He exist and He rewards those who seek Him. Pray!!! Pray!!! Pray!!! James 5:16 Therefore confess your sins to each other and pray for each other so that you may be healed. The prayer of a righteous person is powerful and effective. We have heard this verse many times. Do we believe it? This is verse is so important to understanding John 14:13-14 Whatever you ask in My name, that will I do, so that the Father may be glorified in the Son. If you ask Me anything in My name, I will do it. As one evangelist has stated so bluntly, we do not have answered prayer because we are too lazy to pray consistently. Is this true in your life? We assure ourselves that we stand with the righteous. When we ask in prayer, we must ask in travailing prayer much as Jesus when sweat drops fell from his brow in the Garden of Gethsemane. This is sincere prayer. This is not a head prayer, but a heart prayer. A another wake up call: Ezekiel 3:18-19 If I say to the wicked, ‘You shall surely die,’ and you give him no warning, nor speak to warn the wicked from his wicked way, in order to save his life, that wicked person shall die for his iniquity, but his blood I will require at your hand. “But,” if you warn the wicked, and he does not turn from his wickedness, or from his wicked way, he shall die for his iniquity, but you will have delivered your soul. It is of utmost importance that we understand this. People are dying and we may be their only last hope of salvation. Be confident, stay in the race, never quit, and look toward the reward. Hebrews 4:16 Let us then with confidence draw near to the throne of grace, that we may receive mercy and find grace to help in time of need. 1 John 5:14 And this is the confidence that we have toward him, that if we ask anything according to his will he hears us. Sometimes we must suffer. This is part of our calling. But, as 1 Peter 5:10 says, And after you have suffered a little while, the God of all grace, who has called you to his eternal glory in Christ, will himself restore, confirm, strengthen, and establish you. He is always faithful to reestablish us. Remember Job? Be filled with the Holy Spirit, He is our Helper John 4:23-24 Yet a time is coming and has now come when the true worshipers will worship the Father in the Spirit and in truth, for they are the kind of worshipers the Father seeks. God is a Spirit: and they that worship him must worship him in spirit and in truth. Romans 8:16: The Spirit Himself bears witness with our spirit that we are children of God. 1 John 5:6-8: And it is the Spirit who bears witness, because the Spirit is truth. For there are three that bear witness in heaven: the Father, the Word, and the Holy Spirit; and these three are one. Galatians 5:16-19 Walk in the Spirit, and you shall not fulfill the lust of the flesh. But if you are led by the Spirit, you are not under the law. “Have confidence in your leaders and submit to their authority,. . .” WHY, you ask? “ . . . because they keep watch over you as those who must give an account. Do this so that their work will be a joy, not a burden, for that would be of no benefit to you” Hebrews 13:17. Teach your children and grandchildren Proverbs 22:6 Train up a child in the way he should go; even when he is old he will not depart from it. Deuteronomy 4:9“Only take care, and keep your soul diligently, lest you forget the things that your eyes have seen, and lest they depart from your heart all the days of your life. Make them known to your children and your children’s children— Deuteronomy 6:6-9 And these words that I command you today shall be on your heart. You shall teach them diligently to your children, and shall talk of them when you sit in your house, and when you walk by the way, and when you lie down, and when you rise. You shall bind them as a sign on your hand, and they shall be as frontlets between your eyes. You shall write them on the doorposts of your house and on your gates. Expect God to fulfill His promises. Deuteronomy 7:9 Know therefore that the LORD your God, He is God, the faithful God, who keeps His covenant and His lovingkindness to a thousandth generation with those who love Him and keep His commandments 1 Corinthians 1:9 God, who has called you into fellowship with His Son Jesus Christ our Lord, is faithful 1 Thessalonians 5:24 The One who calls you is faithful, and He will do it. 2 Timothy 2:13if we are faithless, He remains faithful, for He cannot deny Himself. 14. Give thanks in all things: 1 Thessalonians 5:18 give thanks in all circumstances; for this is the will of God in Christ Jesus for you. Psalm 34:1 I will bless the LORD at all times; his praise shall continually be in my mouth. Daniel 6:10 When Daniel knew that the document had been signed, he went to his house where he had windows in his upper chamber open toward Jerusalem. He got down on his knees three times a day and prayed and gave thanks before his God, as he had done previously. Notice, when evil men came against Daniel, he gave thanks as he had always done. Praise God! 1 Chronicles 16:8 Oh give thanks to the LORD; call upon his name; make known his deeds among the peoples!1 Peter 1:3 Blessed be the God and Father of our Lord Jesus Christ! According to his great mercy, he has caused us to be born again to a living hope through the resurrection of Jesus Christ from the dead 1 Peter 2:9 But you are a chosen race, a royal priesthood, a holy nation, a people for his own possession, that you may proclaim the excellencies of him who called you out of darkness into his marvelous light. Again, of utmost importance, remember Who our real foundation is, it is not this world. Government did not build these foundations. God did. Genesis, chapter 1ff. In 2013, there were some 2,100 Christians killed across the globe for their faith. In 2015 that number rose to at least 7,100(Not all ISIS). (3) In 2014 “ . . .the Islamic State (ISIS) . . . published a new edition of the propaganda booklet Dabiq, which is again signaling its primary enemy – Christianity. This “terror groups desire is to conquer Rome and ‘break the cross,’” This aspiration is much like that of the Philistine’s who stood in defiance of God and petrified the Israelite army. “Their goal is to pave the way for the appearance of their Mahdi, the Islamic Messiah.”(1) Just this morning ISIS has announced they will begin attacking London and Washington D.C.
Do we have right to be afraid? As did David, should we stand against those who want to kill us? “The Philistines were mentioned in the Bible as far back as the time when God promised Abraham that he would be the father of many nations. The Philistines were the mortal enemies of the nation of Israel for hundreds of years. When the Israelite’s had finally settled into Canaan, they had to contend with the Philistines. These two nations constantly fought. One of the major reasons as to why the Philistines and the Israelite’s constantly have strife with one another is because of their religious beliefs. The Philistines primarily believed in Dagon (god of fertility) and the Israelite’s believed in Yahweh, or God. These two gods were nothing alike and this religious difference played out in the lives of the Philistines and the Israelite’s in forming their cultures and shaping their lives. America has been a strong nation over the past 240 years. Our strength was formed on the foundation of Christianity. Those who hate us are challenging its very foundation. We see around the world Christians being beheaded and killed in other ways. They desire to come to America, and are already here in small cells preparing to attack when they feel it is time. This is our New Goliath. When I ask if we have a right to be afraid, my answer is this: My first inclination is to say, “YES” we have a right to be afraid. Of course we do. I believe most of us would agree this would be our first thought. We are human after all. We defend our fear by saying God created us with this innate characteristic to protect ourselves from harm. It is part of our human nature. If we see a tornado headed out way our emotion is to get to safety and protect ourselves. If someone wants to hurt our children we immediately run to their protection. Fear is a part of human nature. When Goliath comes for us are we to be afraid? When this huge enemy comes against the foundations of our world are we to grow fearful of what will come? If you are old enough, do you remember the days of uncertainty; post WW2, in the 1950’s and 1960’s when everyone was building bomb shelters? We had atomic bomb drills in school. When the alarm sounded we immediately climbed under our desk, folded up into a ball and waited for the end of the world. Children were genuinely afraid and were relieved when the alarm sounded a second time to tell us to go back to learning. We were preparing ourselves for war. God did give us the emotion of fear as a protection of ourselves. But he does not want us to succumb to our fear. When you read His Word He has promised to support us, therefore, there is no reason to fear. We must trust that promise. Yet, walking into a theater we wonder if someone would enter the theater with a gun and start shooting people. These thoughts do cross our mind. We cannot stop these things from happening if we do not know they are coming. The only thing we can do is to submit our fears to God for Him to protect and support should fears become reality. Like David, if we did not have a human nature of fear we would not need these passages to remind us. The key is to overcome this mortal nature with one of a spiritual walk with out God. The Bible is full of passages where we are instructed to have no fear. In fact there are so many I struggle to decide which ones to use. We all agree with these. I believe most of you are like me in that while we agree with these scriptures we do so with a disingenuous heart simply because we have never had anything, or anyone really stand against us and threaten our lives. This New Goliath is now beginning to do just that. Through out the Word of God we are given example after example of how to handle fear. These examples have ONE thing in common, they trusted God. I imagine Abraham had fear sparked in his heart when God told him to sacrifice Isaac. His fear was quelled by his faith in God. Daniel was thrown into a den of hungry lions. Shadrach, Meshach, and Abednego were thrown into a fiery furnace. Elijah was deathly afraid of Jezebel, who threatened to kill him, so he ran. Each of these men were challenged by their own Goliath. Paul and Peter were thrown in jail for their faith and their lives were threatened. Stephen was a layman just like you and I. He was stoned and killed for his faith. Even in death God is faithful to His promises and delivered each of these men. to destroy both soul and body in hell. We have a hard time understanding what it means to rely on God and put our trust in him. This is why so many gloss over the scriptures that tell us “do not fear.” We battle within our hearts with what it means to not fear when the foundation of our world is crumbling. We struggle with allowing God to be in control. All scripture is inspired by God were written for our benefit. They are God’s Word for us to place in our heart and develop a faith in His security. Instead so many of us do not embed these assurances and move forward in our own strength. When we lose sight of these promises, our worries build an intense scenario that does not exist in God’s Word. When we apply the Word of God daily He will ensure our safety. We need to learn from Job; he had a fence around him so high satan could not penetrate it. How did he have that hedge of protection? Through prayer, worship and obedience to God. How can we build this hedge for our family and ourselves? One prayer is the first brick. Another prayer is another brick on top of that one. Worship is another brick. Obedience is still another on top of these. If in our lives, if we are constantly laying brick, we begin to realize that we are building the same hedge of protection around ourselves, and our family. Our confidence grows and our fears diminish. In this way we begin to see that when we take God at his Word and do not fear, we are growing in the same confidence, the same boldness the saints of old demonstrated in their lives. God is faithful to his Word. 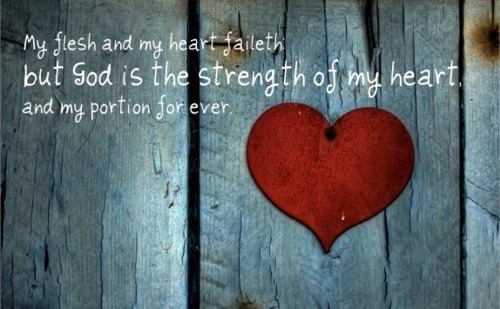 When we develop our hearts and minds to capture God’s strength we learn to depend on Him and His Word. When we have our confidence in Him, we do not have to fear. We know that this Goliath is only one of many that will be defeated by the Almighty. The key is to grow in confidence by FOLLOWING. We prepare for battle in the same way those saints before us have done; we allow God to lead. . . . . .“we follow”. It’s that simple. “Draw near to God and he will draw near to you” (James 4:8). This is how we prepare to meet Goliath. When we follow after God’s lead, “. . .the eyes of the wicked will fail, and escape will elude them; their hope will become a dying gasp” (Job 11:20). Do we have the “right” to be afraid? This is a difficult question. With God’s commands to not be fearful, no, we do not have a “right.” Nevertheless, we have the natural anxiety of fear, which God gave us. But it is not a right. We are to cast away our fears and depend upon God’s protection. When we practice these things in our lives we grow in boldness and the confidence of our Lord and Savior, Jesus Christ. The same blood that got us in, keeps us in. In other words, the same blood that provided us with mercy and salvation when we first met our Lord continues to provide us with mercy and salvation. Like the saints of the Old and New Testaments We must trust in Him. “But thanks be to God, who gives us the victory through our Lord Jesus Christ. There is something we all share in common. Whether we want to admit it or not there is something weighing heavy on all of our minds and hearts. With the exception of a handful of Christian bloggers and pastors, few are discussing it. I like to take just a moment to remind you of two familiar stories about David. In 1 Samuel 17ff. we see the Philistine and the Israeli Armies on opposite hills in a face off. 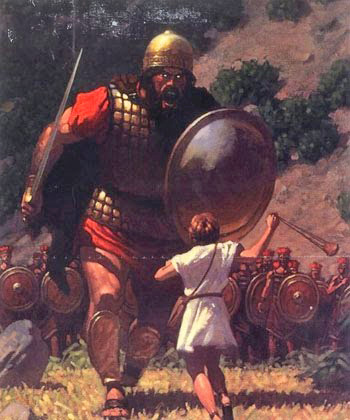 The Philistine champion was named Goliath. He stood nine feet and ten inches tall (For most of us we brush over that as if he is only the size of one of our professional basketball players and don’t take the time to comprehend just how tall he was. Next time you are in a home improvement store, go to the molding aisle and pick up a piece of 10 foot molding and stand next to it. See just how big Goliath was). When you are fitted for your armor you are given that which you can handle with the greatest of ease. In Goliath’s case his sword was longer and heavier than most, his spear was longer that he was tall, and the head of the spear was cone shaped weighing approximately eighteen pounds. His armor weighed in at over 250 pounds, more than the average soldier can pick up on a good day. Please read that scripture again. This time read it out loud, with emphasis and sarcasm in your voice. This is what the Israelite army heard, not once, but for forty days both morning and night. They went to bed hearing it, and woke up hearing it. Notice how Saul’s army was feeling—dismayed and terrified. If you look these two words up in the Hebrew, they simply mean, shattered, broken, greatly afraid, and trembling excessively. Now I ask, if you were taunted twice every day how would you feel? You are waiting and hoping someone, anyone but you, will answer the call. No one does. You hear murmurs among the others saying, “We can’t fight him; he’s way too big for any of us.” You sit and tremble knowing you have no chance of getting close to this giant because he has such a long reach. Understanding that to confront this man means certain death. Pushing each other saying, “You go!¾No you go!¾I’m not going!¾I want to go home—We are all going to die! And then to think if you are to lose to these heathen people you will have to serve them the rest of your life. The Philistine’s know they would beat you, with Goliath’s strength, and you knew it too. The foundations of your world are being destroyed. Fear has you hypnotized. Well, we know how the story turned out don’t we. God sent a lad named David with a slingshot to defeat this huge tormentor and end his relentless persecution. David trusted God and did not fear the enemy. “Saul my father is seeking to put you to death. and stay in a secret place and hide yourself. 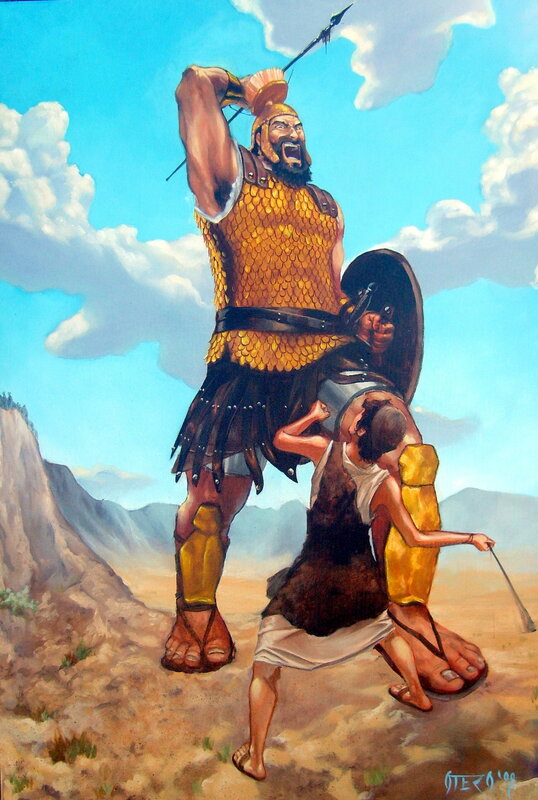 Goliath was David’s first victory in battle. Many others followed. Now he faced a new enemy, a new Goliath if you will, that frightened him. King Saul was God’s anointed king. Saul knew that he was beginning to lose his anointing and that someone would take his place. He believed it would be David’s older brother, Eliab. Because of David’s victories, rumor spread that David was God’s anointed and would take Saul’s place. Saul became jealous of David and assumed he wanted his throne early, so he sought to kill David. Saul continued to pursue him, to kill him. There is controversy over how long this pursuit lasted. Some say eighteen months while others say fifteen years. The time doesn’t matter as much as David’s panic. David lived in constant fear. He continued to run like, as we say in the South, a scalded dog. You know the rest of the story. Saul is confronted by David, who is now holding a piece his garment. David sliced off a piece while Saul was relieving himself to show that David meant him no harm. In fact, David bowed before Saul in honor of the anointing of God on this king. David saved Saul’s life more than once. These are two different stories of David. One is as victor, and one where the foundation of his world was crumbling. He lived in fear. Have you ever been in either, or both, of these circumstances? Have you ever felt like the foundations of your world were crumbling? Did you know what to do and how to handle it? We have a New Goliath on the loose¾He stands and taunts us every 83 days with another killing somewhere in our world. He is huge and stands in the same defiance of the True God as the Philistines did. You’ve heard of all these evil killings and the hatred that has developed over the last several years; especially the killing of those who will not follow Islam, or can’t quote the Koran, and in particular Christian believers. I don’t have to go into a lot of detail to make my point. You know what is happening and if you are like the Israelites–like David–like me–you are scared. You just don’t know what to do so you don’t discuss it. You internalize it and hope it goes away. If you read the news, ISIS is NOW going to kill Christian’s in their places of worship. In fact a Catholic priest was murdered this past week in France while holding mass. Nuns were used as human shields to protect these cowards while they fought off the police. The foundations of our world are being destroyed before our very eyes. The authorities say ISIS is already in all fifty states of our union. They will begin to attack us on a regular basis. So what can I do as a Christian? What can the body of Christ do when the foundations of our world are crumbling? This is Part 1 of this discussion and what has been on my heart and mind for months. In Part 2, I will discuss some of the answers. I would like you to ponder the following questions and have your comments ready for my next post. I leave these questions with you? 1.Based on these two verses of Scripture, Do we have right to be afraid? 2. As did David, should we stand against those who want to kill us? Why, or Why not? How can we stand against them? 3. What can the righteous do? What does your soul yearn for? What does your heart cry out for? I would imagine there are many possibilities. As I sit here this morning thinking about it, this might be the question above all questions, the answer to which will tell us everything about ourselves. If my soul yearns for earthly things, say money or status or power, maybe for drugs or drink, possibly for love and romance… what would that say about my spiritual condition? Why is it that my soul cries out for God when I find myself in trouble, but when all seems well, things other than God have my attention? Oh yes, that says something about my spiritual condition! The things of this life are all around us, the pleasures of this life call out. The problems of this life are all around us as well; they aren’t easy to miss: The things of this life are ubiquitous in fact, and if my attention is to be on the things that are above, maybe I’m going to need to decide consciously to put it there, instead of on the things of this life. Yes, maybe I’m going to need to put my attention on God purposefully, deliberately as a choice I make. After all, don’t our hearts and souls yearn for the things were pay attention to? ROSEBURG, Ore., Oct 1 (Reuters) – A gunman stalked onto an Oregon college campus on Thursday and opened fire, killing nine people and wounding seven before police shot him to death, authorities said, in yet another burst of U.S. gun violence that ranked as the deadliest this year. Stacy Boylan , the father of an 18-year-old student who was wounded but survived by playing dead, told CNN his daughter recounted her professor being shot point blank as the assailant stormed into the classroom. The massacre in Roseburg, a former timber town on the western edge of the Cascades some 260 miles (420 km) south of Portland, was the latest in a flurry of lethal U.S. mass shootings in recent years. I have checked many articles on this shooting. There seems to be a consensus that the authorities are “working to find” the shooters motive. Nine people die, many are wounded and the authorities don’t seem to be listening, even to those who were in the room with the shooter. I believe they don’t want to know, or perhaps do not want to tell the truth. I don’t know about you, but it seems the Oregon shooters motive was very clear—kill Christians. The gunman came prepared to kill as many who follow our Lord as possible. These brave young people stood their ground and sacrificed their lives because they believed in the grace Jesus had provided them by his redemption on the cross. This day they stood and announced, I am a Christian and took a bullet the head causing instantaneous death. 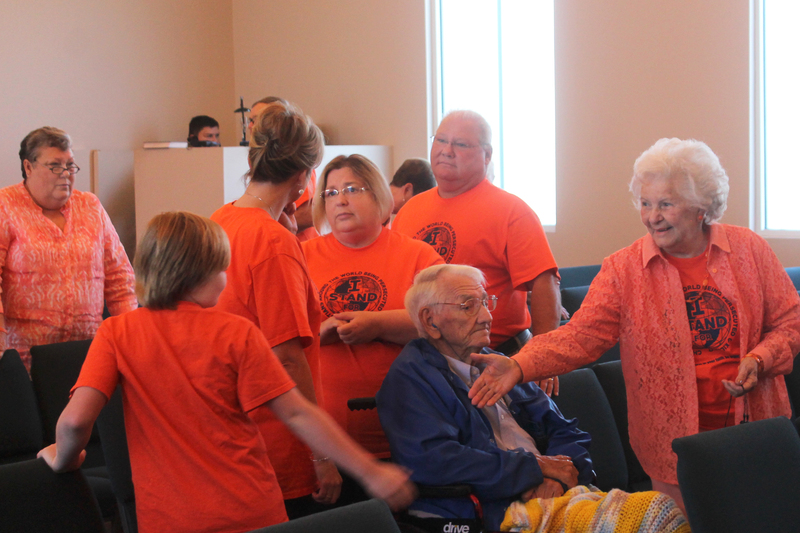 Several weeks ago our congregation stood in orange t-shirts that stated “I STAND WITH CHRISTIANS. 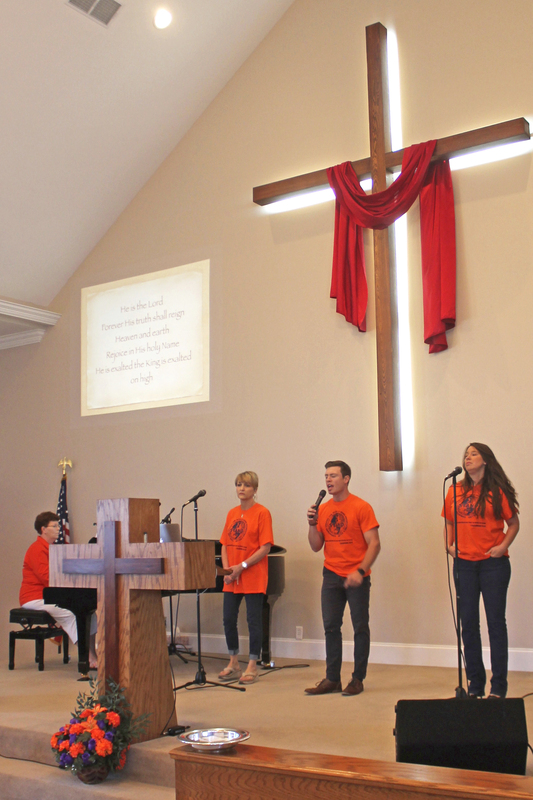 The purpose was to show unity as a congregation to stand with those who have given their lives in the face of those who hate us simply because of our faith—simply because, like no other god, we follow the one and only living God who loves us. So many have died in the last few years because they love their Jesus. We take our stand, as a congregation, with other Christians. Unlike when we are worshiping in our congregation, we are sometimes alone, and without the support of others. We are at a point where we face a personal decision. Such is the case at Umpqua (UHMP’-kwah) Community College. Others stood and watched as friends and classmates were murdered announcing their personal decision, knowing they would be asked next and understanding the consequence. If you stand in a place where you know you were going to die, simply because you are a Christian, I propose this question: When it is your turn to answer, how will you respond to the shooters demand, Are you a Christian? Now is your time. You have choice to make, life or certain death? It is your decision . . . only you can make it. Shall we go a step further and ask, will you STAND for Jesus? Have you given your life to Christ? These young people knew Him personally and announced their decision in the face of death. They were killed, but are now alive in Christ Jesus for eternity. I now believe that Jesus Christ is Your only begotten Son, that He came to earth in the flesh and died on the cross to take away all of my sins. I believe that your son Jesus Christ then rose from the dead on the third day to give me this eternal life. Lord Jesus, I confess to You all of the wrong and sinful things that I have ever done in my life. I ask that You please forgive me and wash away all of my sins by the blood that You have personally shed for me on the cross. I am ready to accept You as my personal Lord and Savior. I ask that You come into my life and live with me for all of eternity. Thank You Jesus, I now believe that I am truly saved and born again. Amen.